One of Amazon’s most lucrative innovations has been its OneClick buy feature. Save your information and you can make those impulse buys immediately. It is fast and convenient. You can make purchasing decisions on the fly with no hassle (but perhaps a lot of cost). With Amazon’s patented 1-Click shopping, which already knows your address and credit-card information, there’s just you and the BUY button. The awesome danger of Amazon OneClick. 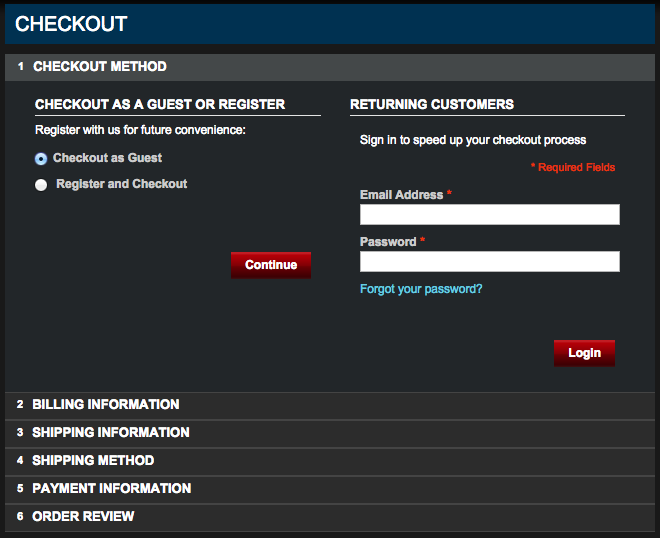 The checkout is the eCommerce gauntlet. One wrong move or one too many clicks and you’ve created a lot of room for a customer to reconsider their purchase and, ultimately, abandon their cart. 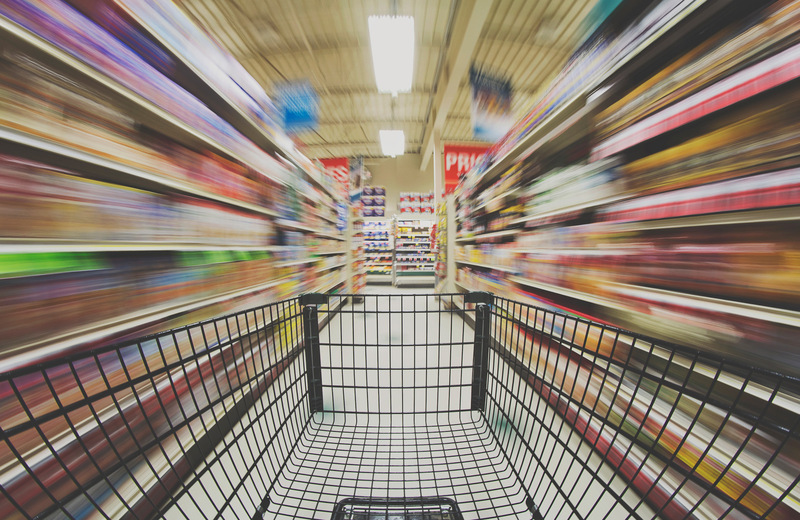 An average of 67.89% of shoppers abandon carts, losing retailers around $18 billion a year. 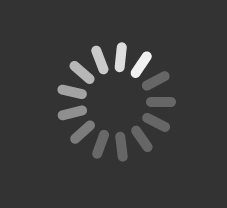 In the e-commerce world, there are many reasons a shopper might abandon a cart: page load time, comparison shopping, high shipping costs (or a lack of shipping information), out of stock items, confusing checkout processes, broken links or an inability to update a cart…and so much more. 6 steps to check out? Maybe I don’t need 20 pairs of blinky shoelaces. Abandon cart. Luckily, donation pages require fewer considerations than eCommerce shops – meaning there’s no excuse to make it difficult to take action. The Internet is here to simplify our lives. Making a donation online should never be more complex or time-consuming than mailing a check. That’s what Amazon got right about OneClick. Not only was ordering on Amazon easier than going to the store, it was practically easier than the entire rest of the Internet. And, consequently, Amazon won the Internet. Making a donation online should never be more complex or time-consuming than mailing a check. Each organization prominently displays their donate button (note a button, and not just a link) both in the navigation menu and at other points on their home page (not on their “about” or other pages). 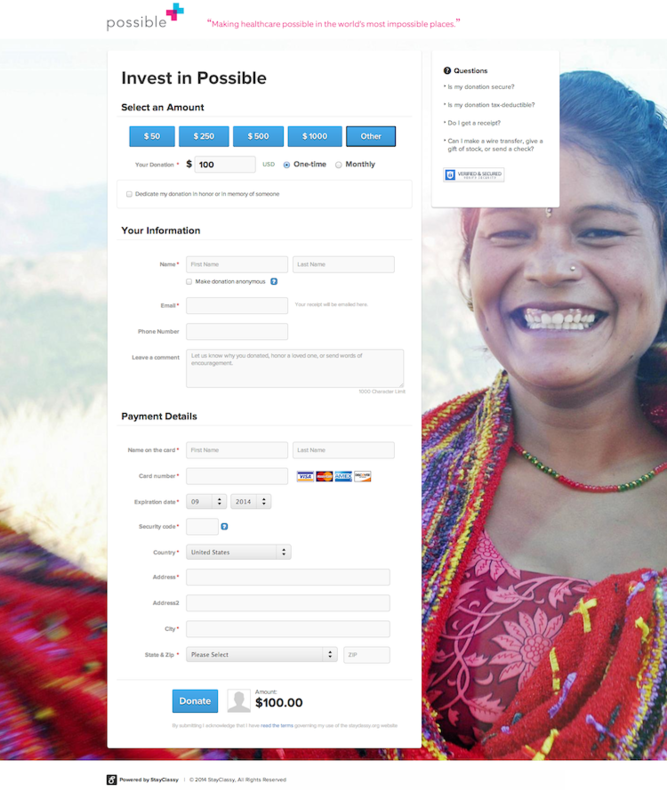 Invisible Children’s donate button actually follows you down the page – clever! That definitely makes for a “me and the DONATE button” feeling at all times. Once a site visitor has clicked on your beautiful and discoverable donate button, optimizing the donation checkout process is about making the giving experience both easy and enjoyable. (Remember, the key to donor retention is delight!) In other words, it’s key to identify and eliminate the points where users get frustrated, stuck, confused and stall altogether. 1. Ultimately, make it about a great customer experience. OneClick is an incredible business innovation, but it really grew out of Amazon’s pride and joy: being a company which has been rooted in, and thrived from, superb customer service. OneClick was about convenience, about providing customers the most painless route to the product they wanted. It won them many loyal customers. There are obviously going to be points of friction that are impossible to eliminate all together, but take the time to analyze and optimize your donation process. Think about donating from a customer perspective: will people care about a cause so much that they’ll go through a terrible process just to support your organization? While there are probably people out there who will find your cause so important that they’ll donate regardless, don’t rely solely on zealous passion. You may be leaving support on the table, especially by those who are new to your organization. Keep supporters on your cause’s digital frontlines by providing them an enjoyable and exciting experience with your organization. OneClick is successful because it leads you straight to the reward – the product you want to buy. BUY IT NOW, it says. SHIP IT HERE, you say. And then a package arrives at your doorstep. There aren’t any mazes to navigate or barriers to reach the end goal. The same should go for arriving at your donation form – and completing it. Once someone decides they’d like to support your cause, it should not be difficult to find out how to take action. Step 1: Click the prominent Donate button. Remember: donating should never be more complicated than writing and mailing a check. Just because it’s online, doesn’t mean it’s been made easy. Your “donate” button should always go directly to your donation form. Sending people to another page where they have to look further for another link can cause potential supporters to drop off. Keep the process straightforward and you could see your conversion rates improve just from small adjustments. Sites like Amazon.com go through thousands of tests and iterations to determine what works and what doesn’t. This goes for everything from copy to the checkout process. Similarly, you can optimize your donation form to determine what is (or more likely, isn’t) working for your organization. Be simple – no extraneous fields or links, just right to the point! Include a personal touch – add motivating copy to your donation page or, at least, “Thank you for Donating!”Testing out your checkout process doesn’t have to be complex, expensive or require a high tech solution. 1. How was the process overall? 2. How did you feel about the amount of time it took you to complete the process? 3. Were there any points at which you became frustrated or stuck? 4. How likely are you to return to make a donation? 5. How likely are you to share the cause with others? You’ll gather some very valuable insights just from a few of these responses! Ideally, a supporter is left happy, self-satisfied and excited to share your cause. Don’t allow a donor to feel like they’ve parted painfully from their cash or, worse, their time. When you convince someone of something, you’re changing their mind — their way of thinking. When you persuade someone to do something, you’re changing their behavior. While this tip isn’t necessarily directly related to OneClick, it’s something I think about a lot. Clicking around sites like Amazon.com, which are so dialed in to customer behavior, only highlights the importance of good copy to the success of eCommerce and, specific to this post, organizations online. What does it mean? Will I be charged twice? Was that form even secure? These thoughts are probably familiar. Don’t make people doubt the integrity of your donation form. Make sure it is obvious to donors that they have completed their donation successfully. And, as always, say thank you, include social share buttons and links to impact stories about how the donation has helped your important cause. On Amazon, and other sites that have paid attention to these details, I’ve never had to doubt whether or not my item was added to a basket, my information was captured, or my order complete. This kind of assurance greatly improves trust and customer loyalty. Hopefully, connecting some aspects of donation checkout optimization with the epitome of optimization – the OneClick – has left you thinking about some ways to improve the donation process for your supporters. 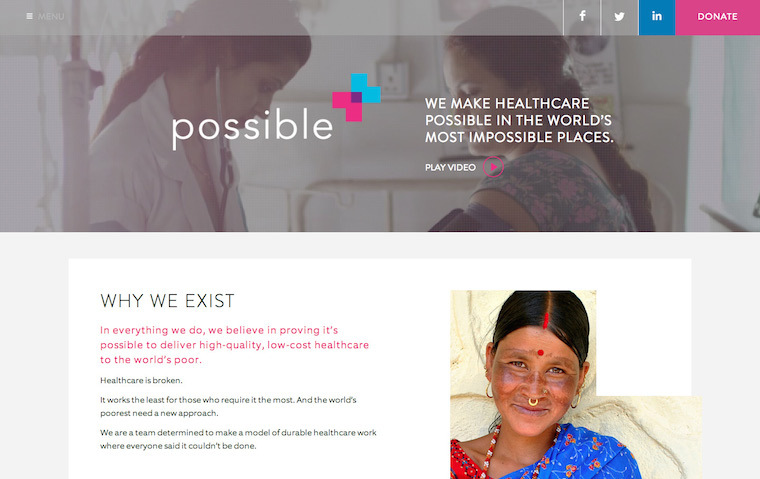 While nonprofit organizations may not be the next Amazon.com, they can certainly aim to increase donations by providing supporters with A+ experiences online.